Converting our RGB memories to the CMYK spectrum. We use a wide variety of devices to capture the important moments in our lives. Whether it is a phone camera at a baseball game, or a professional camera at an art gallery, the memories we capture are as important as the moments themselves. But how do we get those memories to transfer over and be as visually striking when we print them? 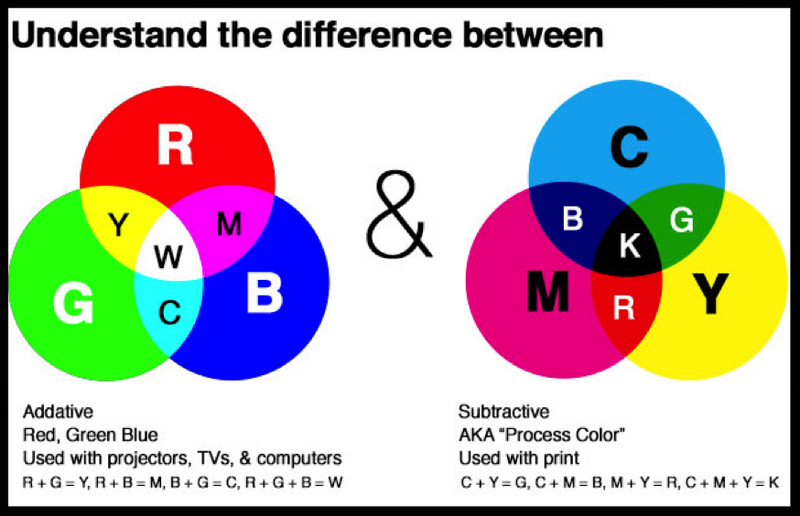 First we have to understand the basics of the printing process and converting our RGB memories to the CMYK spectrum. Viewing an image on a screen and viewing an image on a printed page differ in a very important aspect: RGB is light that adds color to arrive at the color you see, and CMYK is ink that subtracts color to arrive at the colors you see. When you look at a screen, it glows bright with the colors of the RGB color spectrum making it an additive system. We can imagine the system is being made up of three different colored light bulbs - red, green, and blue. The system is called "additive" because as the different colored lights add together, they create more light. For example if you have a red light shining on top of a green light, their combined colors will be brighter then if they were by themselves. Inversely, when you look at a piece of paper it does not produce light, so the inks on the paper are forced to react to the light provided to it from an outside source making CMYK a subtractive system. This means when there are more colors added to each other they subtract the amount of light that is reflected off of the paper. If you add all of these colors together they will become very dark, whereas if you add all of the RGB colors together, they will become very bright. So how do we get the light from our monitor to translate to the ink on the paper? The first step in getting a great photo from your monitor to paper is calibrating your monitor. Calibrating your monitor sets the intensity and RGB color representations to standard profiles so when we print with a color profile, the profile can accurately adjust the viewing colors. Every monitor is different, even monitors from the same manufacturer can be drastically different, so making sure to calibrate is key. There are several calibration hardware and software’s available if you would like to go a more professional route, but just making sure to use your monitors standard calibration system will certainly put you on the right path. Part of the calibration is checking the brightness. Calibration will help check your brightness and make sure that your photo is more accurately represented. As mentioned before, images on a screen will always be lighter than an image on paper, so having a monitor that is set too bright could give you a false representation of how bright your image actually is, causing it to print too dark. Along with the brightness of the screen dark images are also difficult. When you’re capturing a memory in the moment, you might not always have the perfect lighting, so post processing is sometimes necessary to slightly lighten your image. Try to use as little post processing as possible since too much will cause your photos to become grainy. Sometimes an image looks great on your mobile device or photo browser, but doesn’t translate well to print. We suggest the 200% test. When you have your image open in your preferred image viewer, zoom in to 200%. If your images look blurry, pixilated, grainy, or jagged then they could translate that way to print. Our software will let you know if an image may be blurry or pixilated due to low resolution, but if you would like to be extra sure use the 200% test. You may also check the dpi (dots per inch) and the pixel size of the image in your preferred image viewer to be thorough. We put forth a tireless effort and inexhaustible amount of diligence to make sure that every project is a stunning representation of the effort and love you put into creating it. But, even by taking all of the precautions and preparations your color can still sometimes be off. Our monitor’s even struggle to reproduce the beautiful and vibrant colors we see in life, and printing has an even more limited color spectrum with the biggest loss being the gradation of colors we can see, our monitor can project, and our printer can reproduce (see fig 1. Below). Hopefully with the provided information, and our attention to detail, we can create a breathtaking representation of your treasured memories.